I spent a second day in the Spring Mtns northwest of Las Vegas, visiting a trio of 10K peaks north of Mt. Charleston. Two of the summits are featured in Zdon's Desert Summits book which I have been loosely collecting over the years. Midsummer heat in the lower reaches played a big part in keeping me as high as possible during my trek across the Southwest to Colorado where I was due in a week. This was the most interesting of the three peaks, reportedly the most difficult of the high peaks found in the Spring Mtns. The Southwest Gully route is steep class 3 according to Zdon and other sources. Starting from the Upper Bristlecone TH at the highest stretch of pavement in Lee Canyon, I followed this up for two miles to its junction with the Bonanza Trail along the crest of the range. The Bonanza Trail continues north and northwest past Peak 10,068ft, for a total of about four miles until on the south side of McFarland. It's a nice hike along the trail through forest open to views for much of the journey. Mummy Mtn is seen to the east with the highest peak in the range, Mt. Charleston, visible to the south. Yesterday's clouds had all but disappeared, leaving a few low ones creeping up from the valleys below as the morning started to warm. McFarland comes into view past Peak 10,068ft, with sharp cliffs on its eastern flank discouraging shorter approaches from that side. I followed the trail until it begins a series of short downhill switchbacks. A large snag leans against a large rock that I recognized from one of the photos I'd seen. A use trail can be found leading away from the trail to the base of the Southwest Gully. The climb was not as difficult as I had been led to believe, most of it steep class 2 with a few moves of class 3 sprinkled here and there, none of it with any real exposure. Rockfall was minimal and it did not seem to pose a problem for larger groups that might venture up this way. It took about 25min to climb the gully from where I left the trail to where the gully tops out west of the summit. Less than ten additional minutes then led to the highpoint. Though unobstructed by trees, my views were marred by the misty clouds that were rising from below and I only managed fleeting views to Charleston and the surrounding terrain. Like the day prior on Cockscomb Ridge, a register found at the summit dated back only a few months. After snapping a few cloudy photos, less than 30min was needed to get back down to the trail. So much for one of the toughest peaks in the Spring Mtns. 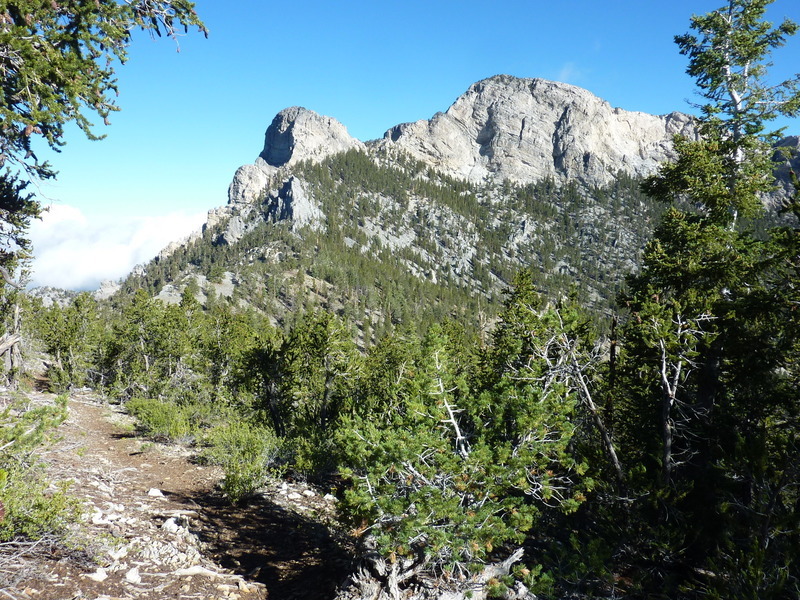 Less than 2mi NW of McFarland, Bonanza Peak doesn't really have a whole lot to recommend it. The Bonanza Trail doesn't actually go over the summit, but it comes fairly close at less than a quarter mile. The northern route starting from Camp Bonanza is a good deal closer, but if you have the time and energy it isn't so hard from Lee Canyon either - just follow the trail. I left the trail to climb up the west side and then descended down the south side, both steep but class 2. A use trail appears to reach the summit from the north if you want an even easier way to reach the top. A few trees share space with the summit rocks but it was clouds, not trees that kept the views at bay. Branch Whitney, a Las Vegas resident, peakbagger and guidebook author had left a register the previous year, but it appears he has detractors who chose to deface the booklet with their judgements of Branch - apparently the mountains do not bring good tidings equally to all of those that visit them. This unnamed summit lies a little more than a mile SE of McFarland. I had passed by the top as I followed the trail to McFarland earlier in the morning but decided to pay it a quick visit on my way back. The summit has a small cairn and some trees blocking much of the views, and also featured a Gordon/Barbara register from 2002. Seventeen pages suggested it is more popular than I would have guessed. The entries do not seem to be from the usual suspects chasing down NV 10Kers, but rather a mix of wandering souls, Boy Scouts, hunters and photographers looking for a Bristlecone speciman for that perfect sunset shot. I spent the last hour and change returning to the TH where I'd started some 8hrs earlier. A few shortcuts helped shaved some distance off the trail miles but probably didn't save much time.